The hardest part about using video in a PowerPoint presentation is finding video worth showing. 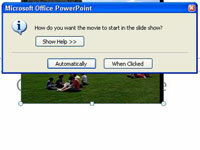 PowerPoint comes with movies in the Media Gallery, and Microsoft has them in its the online Media Gallery. You can also find a wide variety of video clips available for download on the Web. 1Move to the slide on which you want to insert the movie. Be sure you have a big blank space on the slide to put the movie in. If not, rearrange the existing slide objects to make room for the movie. 2Open the Insert tab on the Ribbon and then click Movie in the Media Clips group. The Insert Movie dialog box appears. 3Select the movie that you want to insert and Click OK.
You might need to scroll the list to find the movie or navigate to a different folder. A dialog box asks whether to play the movie automatically when the slide comes up or wait for you to click. 4Click Automatically or When Clicked. The movie is inserted on the slide. 5Resize the movie or drag it to a new location on the slide.